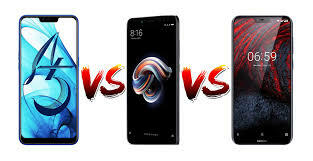 case study Who is better in Oppo A5, Redmi Note 5 Pro and Nokia 6.1 Plus? Who is better in Oppo A5, Redmi Note 5 Pro, and Nokia 6.1 Plus? The handset maker Oppo has launched its mid-range budget smartphone Oppo A5 in India. Oppo A5 has the same dual-rear camera like the Apple iPhone X and the Nokia feature. Oppo A5 has Beauty Technology 2.0 based on Artificial Intelligence, which claims to recognize 296 face points. The price of OPPO A5 is Rs 14,990 in India, at this price it will hit the Nokia 6.1 Plus and Shaomi Redmi Note 5 Pro in the handset market. Let's say that Nokia's Nokia 6.1 Plus is also part of Google's Android One program, like Nokia's other smartphones. This Nokia smartphone comes with a 16-megapixel selfie camera. So at the Redmi Note 5 Pro, you will find a 20-megapixel selfie camera. Whether Oppo A5 will compete with its resistance handset Redmi Note 5 Pro and Nokia 6.1 Plus. For this, we are going to tell the difference based on specification and price. Oppo A5 will be sold in India for Rs 14,990. It will be available in Blue and Rose Gold colors. At this price, this smartphone will beat Asumi ZenFone Max Pro M1 (6GB), Vivo Y83, Samsung Galaxy J6 and Nokia 6.1 in addition to Shoomi Redmi Note 5 Pro and Nokia 6.1 Plus. The price of Xiaomi Redmi Note 5 Pro starts at Rs 14,999 in India. This price is of 4 GB RAM and 64GB of storage variant. The price of 6 GB of RAM and 64 GB storage is 16,999 rupees. The handset is sold on Flipkart and Me dot com in Black, Gold, Lake Blue, and Rose Gold. Please tell us that the 4 GB Ram and 64 GB storage variants of Xiaomi Redmi Note 5 Pro were launched at Rs. 13,999. But after 2018 the price was increased by Rs 1,000. Nokia 6.1 Plus will be exclusively sold on e-commerce site Flipkart. Apart from this, it will also be available on Nokia's own website. Sales will be from August 30 to 12 noon and its cost is Rs 15,999. The pre-order booking of this handset of Nokia has started on the Nokia website. Dual SIM Oppo A5 runs on ColorOs 5.1 based on Android 8.1 Oreo. There is a 6.2-inch HD + (720x1520 pixels) full view display. The screen is of 19: 9 aspect ratios and its screen-to-body ratio is 87.9 percent. The display has a 2.5-d well glass panel above the display. The smartphone works to accelerate 1.8 GHz clock speed octa-core Qualcomm Snapdragon 450 processor. Adreno 506 GPU for graphics is integrated and 4 GB RAM is provided with it. There is a dual rear camera setup in the handset. The primary sensor is 13 megapixels, it is equipped with F / 2.2 aperture. Secondary sensor is 2 megapixels, which is an aperture F / 2.4. There is also an LED flash on the back side. The front panel has an 8-megapixel sensor with F / 2.2 aperture. A front sensor has many AI beauty features. It can identify the 296 facial features. This phone of Oppo has inbuilt storage of 64 GB, and it is possible to use a microSD card of up to 256 GB if needed. Oppo A5's connectivity features include 4G VoLTE, Wi-Fi 802.11b / g / n, Bluetooth 4.2, GPS / A-GPS, Micro-USB and 3.5mm headphone jacks. The battery of the smartphone is 4230 mAh and its dimensions are 156.2x75.6x8.2 millimeters. Dual SIM Shoomi Redmi Note 5 Pro runs on MUI 9 based on Android Noaga. There is also a 5.99 inch full-HD + (1080x2160 pixels) display. The screen is of 18: 9 aspect ratio. Snapdragon 636 processor with 1.8 GHz, works to accelerate the phone. Adreno 509 GPU for graphics is integrated. RAM has two options - 4 GB or 6 GB. The fingerprint sensor is also on the back part in this handset. Xiaomi Redmi Note 5 Pro has dual rear camera setup. On the back side is the primary camera of 12-megapixel f / 2.2 aperture. With it, there is a 5-megapixel sensor with F / 2.0 aperture present in Jugalbandi. LED flash module with dual rear camera setup has been given. There are a 20-megapixel Sony imax 376 sensors on the front panel. There is a storage 64 GB in both variants of Shaomi Redmi Note 5 Pro and it is possible to use MicroSD card even when it is necessary. Nokia X6 was first launched in China in May and Nokia 6.1 Plus is the Android One variant of this handset. This means that Dual-SIM (Nano) will run on Nokia 6.1 Plus Android 8.1 Oreo. It has a 5.8-inch full-HD + (1080x2280 pixels) display. It comes with the protection of 2.5 d Gorilla Glass 3. The smartphone has a display notch. It comes with 19: 9 aspect ratios. It has 4 GB RAM with Octa-Core Qualcomm Snapdragon 636 processor. The Nokia 6.1 Plus connectivity features include 4G VoLTE, Wi-Fi 802.11 AC, Bluetooth 5.0, GPS / A-GPS, 3.5mm headphone jack and USB Type-C port. There is a 3060 mAh battery in the handset. It comes with 18 Watt charger. It will charge 50 percent of the phone's battery in 30 minutes. This is possible due to the quick charge 3.0. The dimensions of the handset are 147.2x70.98x7.99 millimeters.